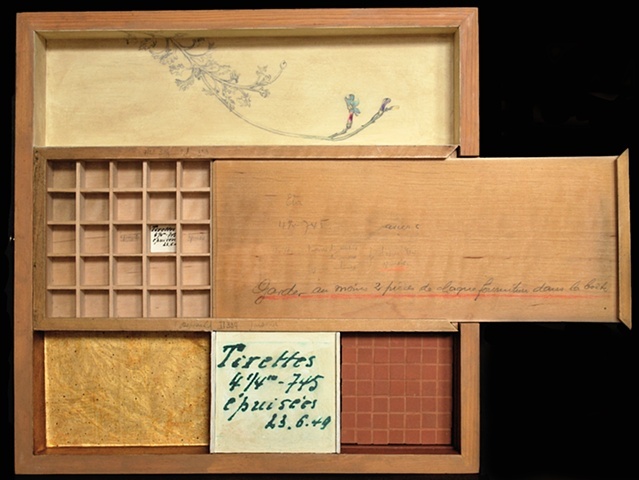 The title, Tirettes Epuise'es, refers to the small piece of paper inside the box grid. Loosely translated it says, "knobs depleted or exhausted", and then the size of the knob and the date. I Have used the word epuise'es as it was written, although it was spelled differently in another grid compartment. The box is an old watchmaker's parts drawer that fit into a larger cabinet. The grid compartments each held a different size part. I I mounted the drawer in a box I had made in the 1970's but never used. I guess you could say the found drawer is mounted into a re-found box. I love the personalization, the hand-writing on the box by the owner, it says to always keep at least two pieces (parts) in the box.